United Way of East Central Iowa (UWECI) held its second Sweeping for Change curling tournament on Friday, August 13. In partnership with Cedar Rapids Curling, ten teams participate at the Cedar Rapids Ice Arena. To start the day, teams participated in a one-hour curling practice to learn the basics of the sport. Cedar Rapids Curling team members were matched with each team to help ensure proper technique and help them start off on the right foot. 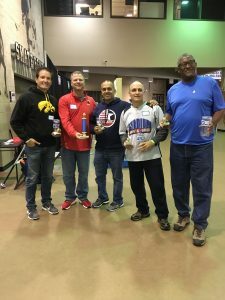 Once teams were comfortable with the rules and basics, Cedar Rapids Curling team members helped the teams get their game faces on for tournament play. 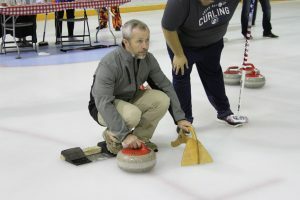 The curling tournament allowed each team to play three rounds. The three teams with the most points received first, second, and third place trophies and the team with the most spirit received special recognition as well. Second Place: Ice, Aw’ the Sign! Thanks to the sponsors and teams, the $6,300 raised will allow United Way to continue to work to break the cycle of poverty in our community with the help of our funded partners. Interested in learning more about curling? Reach out to Cedar Rapids Curling.